We were most surprised to see Dafydd and Maria Hughes walk in to church this morning, along with their two gorgeous kids, Ajinkya and Anjali. Dafydd is the pastor of the reformed Baptist Church in Palmerston North, so Sundays would normally see him behind a pulpit! Had we known they would be down our way on holiday, Nick would have put Dafydd straight back behind our pulpit (must be why they travelled on the quiet :) ). 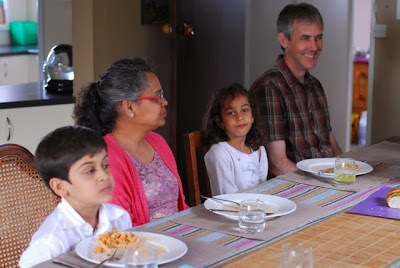 Had them around to lunch and although Nick has fellowshiped with them a fair amount at various FRBCNZ functions, I have spent very little time with the family so it was wonderful to sit around the table over a meal and chat. We enjoyed our time with you too! Great to be sitting in the congregation for a change, and to be blessed with good fellowship and warm hospitality. Thank you!